My husband and I lived in Memphis while he attended optometry school, and during that time I worked at Ruth’s Chris Steak House as their sales manager. One of the most valuable lessons I took away from that job was that a good steak—I mean a truly good steak—only needed a few things: a lot of salt and pepper, a very hot grill and butter. Oh, and you have to start with quality meat. That’s rule number one. My husband loves steak, but he likes it to be well done, yet tender. That’s not an easy task, and I’m always nervous for both he and the restaurant staff when he orders a steak on date night! At home I’ve tried to find a way to be able serve a big steak dinner for him, just the way he likes it (and hopefully a way I’ll like it too, since I don’t like well done steak!). I learned about reverse searing steak by watching one of those short recipe videos that float around on Facebook, and I was intrigued! It makes sense that cooking a thick steak for a long time at a low temperature would keep the meat incredibly tender, melting the fat inside the steak instead of creating gristle, and making it more consistently cooked to the right temperature. Then you quickly sear the outside, creating the perfect charred crust. Since I started doing this, we’ve not had to put an undercooked, half-cut steak back on the grill yet! It takes time, but it is worth it—at least for Father’s Day! He’s earned it. 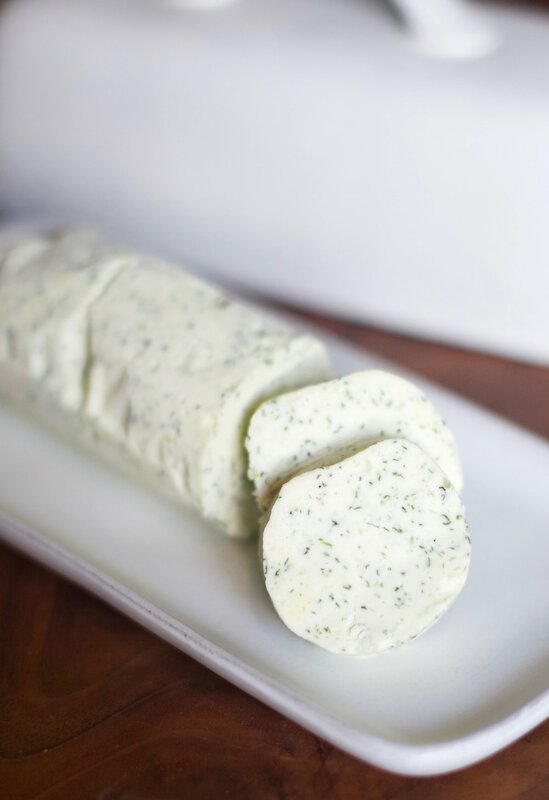 At Ruth’s Chris Steak House, they finish every steak with a generous drizzle of good quality salted butter. 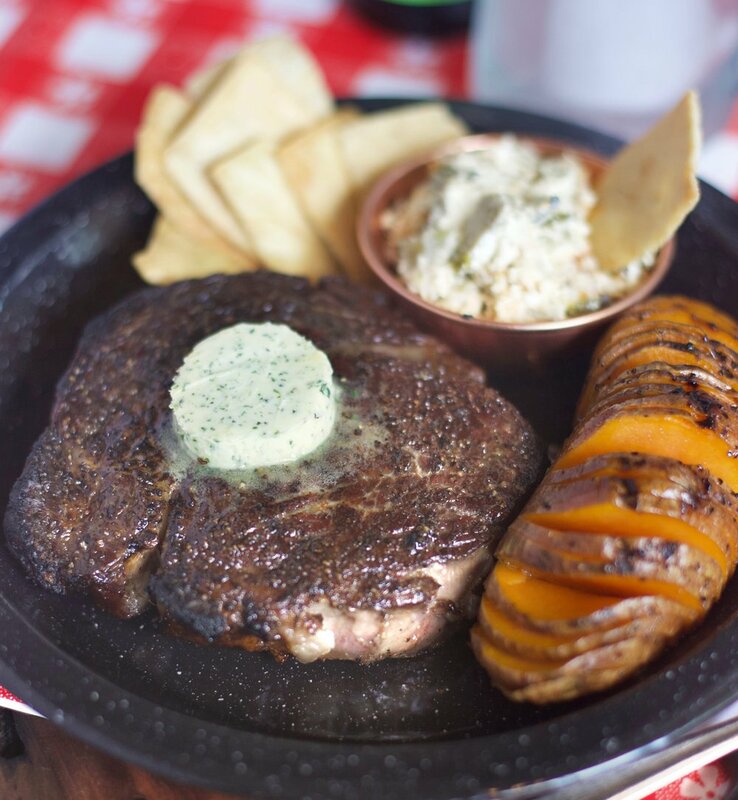 It’s the perfect touch and ensures that every steak comes out sizzling. To switch it up just a bit I added fresh herbs and garlic to my butter to add more flavor to the steak without overpowering it. 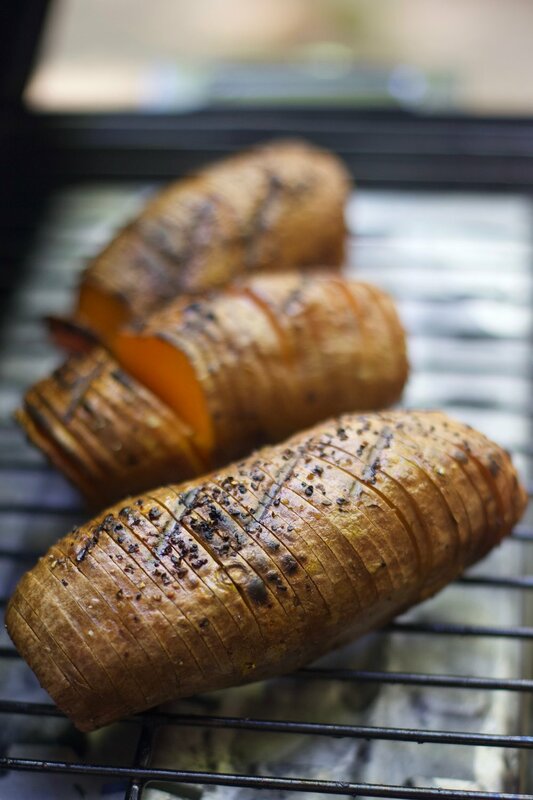 Hasselback sweet potatoes and a hearty and spicy dip will make this a Father’s Day he’ll remember! Most of these recipes can be prepared in advance, and they balance grilling with oven cooking so you’re not spending all day over an open fire, yet dinner will feel like you did! Happy Father’s Day to all you dads who’ve earned a steak fit for a king. My dad, Rick, my father-in-law, Johnny, and my husband, Brian, are all such wonderful examples of what good fathers should be: generous, reliable, funny, wise and a safe place to land, because sometimes the world can get as tough as a well-done steak. In medium bowl, thoroughly combine all ingredients, then carefully form into a log on parchment paper, about the thickness of the original stick of butter. Roll up and store in the freezer until ready to use. To assemble, run a sharp knife under hot water, then carefully slice ½-inch slices and place on hot steak (or any meat) just before serving. Will keep for up to 6 months if stored in the freezer. Thoroughly combine cream cheese, sour cream, garlic, cheeses and the salt and pepper. Set aside. Lay artichoke hearts, jalapeños, poblano and the green onion stalks on a sheet pan. Drizzle with 1 tablespoon olive oil and a pinch of salt and pepper. 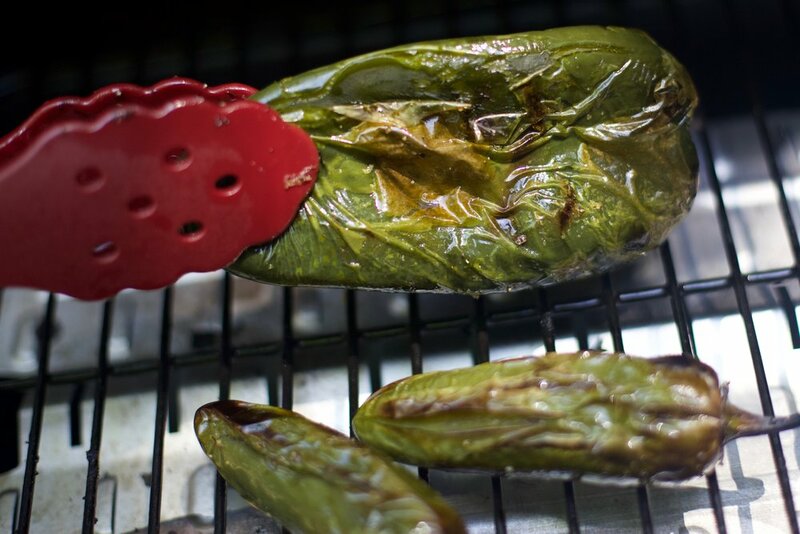 Place everything but the artichoke hearts directly on the grill (use foil under artichoke hearts to prevent them falling through the grates). Set the halved lemon directly on the grill, just until charred on the bottom. Be careful when picking it up—it will be very soft and juicy. Grill the artichoke hearts and green onion until lightly charred, flipping once. Allow the peppers to become charred on all sides before removing. Allow the peppers to cool slightly, then peel the skin away and remove the seeds. Chop everything but the lemon and combine with the cream cheese mixture. Squeeze the grilled lemon and stir to combine. Place in an oven-safe dish, cover with up to ½ cup more shredded cheddar, then bake at 400 degrees just until cheese melts. Serve hot with pita chips or sturdy veggies. Preheat oven to 400 degrees. Wash and dry potatoes. Trim the very ends off, then with a very thin sharp knife, slice the potatoes almost ¾ of the way through, being careful not to slice all the way through. You should have slices about ¼-inch thick. Drizzle with olive oil, salt and pepper, then bake at 400 degrees for 45 minutes. Remove from oven and place on grill for a few minutes on each side. Carefully remove and drizzle with honey before serving.